It's Monday again, boy do Monday's come around so fast these days! Well, I have been playing with Junes Monthly Make Set and came across this lovely technique that works well with both Distress Ink AND Oxides! Check out those butterflies, if you look really closely you will notice the solid butterfly is different colours - cool hey! So how do we do it well it's really simple! Shall we start with our Distress Oxides? Of course, why not for this one I used twisted citron, peacock feathers and seedless preserve Distress Oxide. I started by covering the whole of the solid butterfly with twisted citron and stamped it onto my card. Make sure you clean your stamp between each colour otherwise you will contaminate your oxide pads!!!!!!! Next ink up the centre 2/3 of the stamp using peacock feathers, stamp this over the top of the twisted citron one. A stamping platform will help line this up perfectly but it is just as effective lining it up by eye! Then ink up the centre 1/3 using seedless preserve and stamp that over the top. Make sure your butterfly is completely dry and ink up the outline butterfly using a permanent ink (I used Archival). And stamp this over the top! Ink up the whole of your stamp using twisted citron, then the centre 2/3's using peacock feathers and finally the centre 1/3 in seedless preserve. Spritz with water and stamp onto your card. Leave to dry and then over stamp the outline in a permanent ink - notice how my outline isn't solid, well that's because I concentrated inking up the centre of my stamp and not the outside sides, i.e. I pressed the ink pad really hard in the centre but not at the edge. To finish off my cards I used the same ink colours to distress the background, stamp a few of the mini butterflies and the Distressed panel. Then I stamped the saying in Permanent ink. Normally I would have created my background first but as I wanted to share these fab colouring techniques I started with them! AND I must dash as we have a very special bumper Christmas edition out this week too!!! 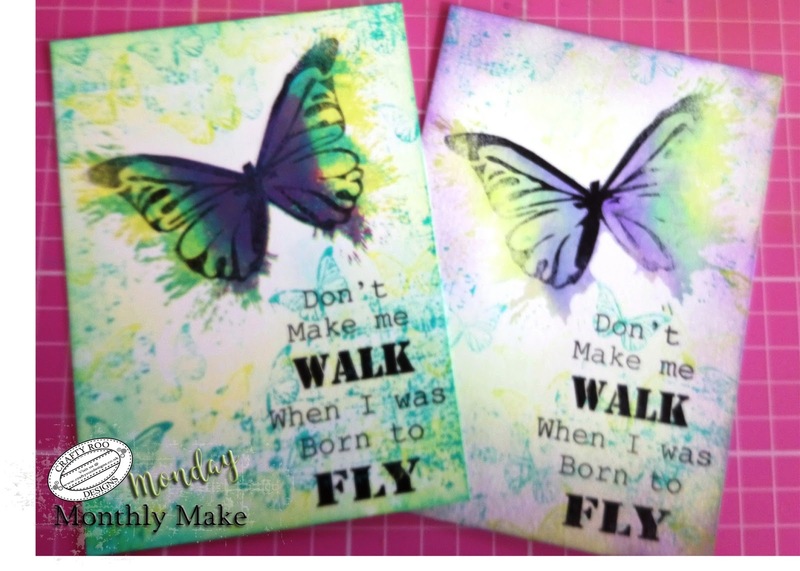 Monthly Make Monday - Stamping Off!!! Monthly Make Monday - 'Tis the Season! Monthly Make Monday - Born to fly!! !